Are you tired of those unattractive blemishes, freckles, spots and marks on the skin? Do you get low every time you look into the mirror? I am sure you must have tried almost every suggestion in the book – from home made remedies to skin whitening cream to get rid of those, but unfortunately failed. 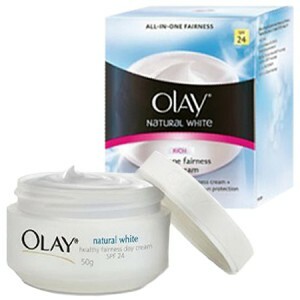 Olay Natural White Day Cream is suited to all types of skin, from normal to dry skin. It contains SPF 24 hence provide better sun protection. The Triple Nutrient System-Vitamin B3, Pro B5 & E helps in lightening skin color. However, Olay comes with its own disadvantages. The cream is too greasy for oily skin and does not work well with fine lines or wrinkles. Price is Rs. 299 for 50gms. 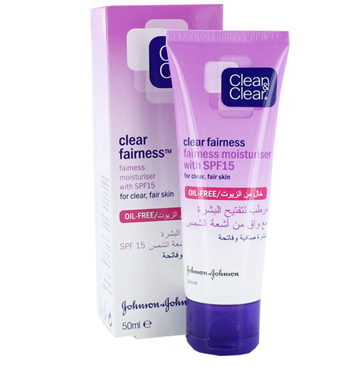 Clean and Clear Fairness Cream is mostly suited for oily skin. The cream contains UV filters and gives a kind of matt finish to the skin. Above all it does not clog pores and just a bean size amount is sufficient per application. On the cons section the cream may leave a whitish cast on dry skin making it look abnormal. Ingredients like the alcohol content in the cream are not good for skin. Price is Rs. 120 for 40gms. 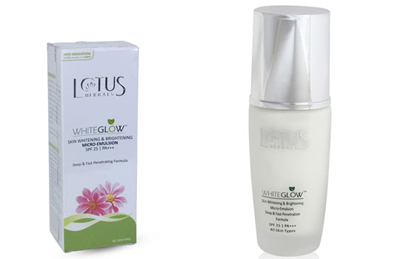 Lotus Herbals White glow skin whitening and brightening skin emulsion acts as an oil remover for oily skin. This quick absorbing lotion contains just the right SPF and PA levels. The plastic pump makes it easier to use. But users are mostly disappointed because of its lesser quantity. Price is Rs. 225 for 40ml. 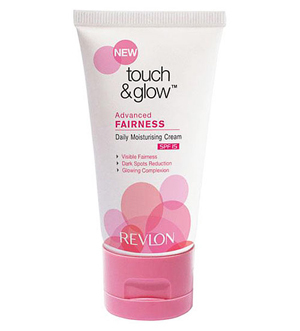 Revlon Touch and Glow is unisex, hence can be applied without any discrimination. It contains botanical extracts dipped in multi-vitamins and SPF 15 to give a matte finish to oily skin types. It also stimulates cell renewal for healthy looking skin. The only short fall of Revlon Touch and Glow is that it may at times cause break outs. Price is Rs. 170 for 40gms. 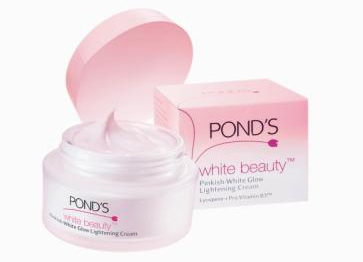 Pond’s White Beauty is perfect for oily skin and is an ideal wear during humid weather conditions. The SPF 20 content acts as a good sun protection. The cream is easily absorbed by skin and lightens complexion giving it a pinkish glow. However, the cream is not ideal for dry skin as it does not provide enough moisture to keep it fresh. Moreover, the packaging is not travel friendly. Price is Rs. 140 for 35gms. 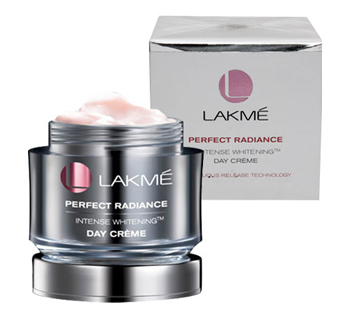 Lakme Perfect Radiance Intense Whitening Day Cream is enriched with goodness of Vitamin B3 that is of the major component for fairer complexion. It keeps the skin moisturized with no trace of white cast bringing perfect glow to the skin. Parabens content in this product hold it back in the market. It also might at times cause break out. Price is Rs. 199 for 50gms. 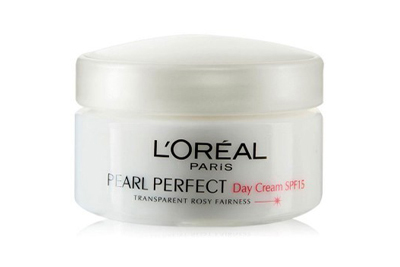 Loreal Paris Pearl Perfect Transparent Rosy Fairness day cream is suited for all types of skin. The cream claims to stimulate micro-circulation on the skin and the SPF 15 content acts as a good sun protector. One most disturbing con is that the product is bit too pricy compared to other options in the same category available in the market. Moreover, the tub packaging is not very travel friendly. Price is Rs. 599 for 50gms. 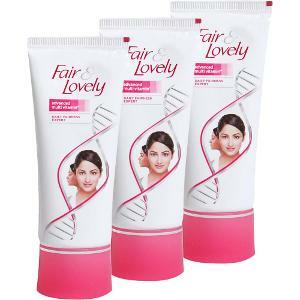 Fair and Lovely Multi Vitamin is up with a multivitamin formula. The beautiful fragrance and hygienic tube packaging is the selling point of the product. It provides triple sunscreen protection against ultraviolet rays. Moreover, it does not contain alcohol like other fairness creams in the market. Disadvantages include it makes the skin oily after some time (actually a plus if you have a dry skin). Again, the result is unpredictable. For some changes are seen overnight while some remains unaffected at all. Garnier Light Overnight Peeling Fairness Cream is one of the most used overnight fairness cream in India. The micro peeling fruit extracts with rich Vitamin C content exfoliates and lightens complexion. The cream is unisex and is ideal for all skin types. However, the cons include the strong lemon fragrance that is not liked by all. The greasiness makes its unfit for oily skin. Price is Rs. 175 for 40ml. 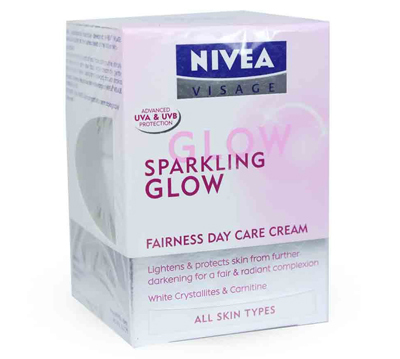 Nivea Visage Sparkling Glow reduces melanin reproduction and gives a clean and clear skin making you fairer. The SPF content protects skin from ultraviolet rays. It is an ideal wear for all skin types. It also keeps the skin hydrated and moisturized. The jar packaging is not much liked by the customers and the product is a bit too overrated. Price is Rs. 289 for 50ml. Fairness cream immediately doesnt make you fair. You have to take care a lot of your skin like peeling ,moisturizing ,cleansing,toning etc etc. Go to This site rahulphate.com .They have ultimate product range as per skin types. Follow as per instructions but with their opinion only ,by calling to their call center. other products also effective in market like brand Lotus , revlon etc…… you can use that. Here in chennai savory fairness cream is best suited for women and men. and there is also a cream which i forgot the name, but that is especially made for babies. Does Chennai savory fairness cream really work and can you use it through out your whole body. What does it cost? But my face skin dart. compair bmy body skin. hi, i want to glow my skin .i want stop to the melanin to my skin plz help me …. I generally use Seabuckessence skin care products.These are beauty products that have type of berry called the “Sea Buckthorn” which helps improve the look of our skin. I could feel the difference. use Dalacin t topical lotion for 6 months. it will remove all pimples and pimples spots. Hi , im chennai , im normly color but my face dull and black , pls suggest me fairnss cream . im still using fair&lovly only ,. pls help me plssss. Please I have a very sensitive skin type..I tried a lot of creams but still my dark spot on my cheeks does not dis appear. please help me for my dark skin to do it clear whos cream best for me . my skin is oilly. Hi pls help me. I’m indian. My hands n body in certain places are very dark. What can I use? ek cream esi batao jisase gora ho jaye pr pipal na nikale. is no pr call karna.